Sit back and relax with a small group in the comfort of your mini-coach, as you travel to the amazing Grampians. Your Guide will provide details of the day’s itinerary while you enjoy the journey west, stopping along the way for complimentary morning tea in the charming township of Beaufort. 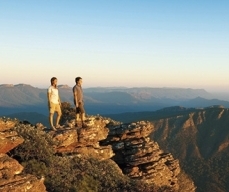 One of the world’s oldest and most spectacular mountain ranges, rich in Aboriginal history with its high concentration of rock art and with an abundance of wildlife, the Grampians National Park is sure to inspire you! Your Guide will point out the unique wildlife including kangaroos, koalas, emus and a vast array of birdlife, so be sure to keep your eyes peeled. Located in the heart of the Grampians National Park is Halls Gap, a delightful small town nestled between the soaring rocky mountain peaks that constitute the Wonderland and Mount William Ranges. You’ll have time here for lunch (own expense) then you can stretch your legs on a nature walk – you may even spot a kangaroo! Learn about the indigenous culture of Gariwerd, the traditional name for the Grampians, at Brambuk – the National Park and Cultural Centre. The centre brings to life the amazing history and culture of the local Aboriginal communities. It is also the perfect place to experience Australia’s native flora and fauna. Take in the stunning views over the Victoria Valley and the Serra Range, Lake Wartook and the Mount Difficult Range on your visit to Boroka and Reeds Lookouts. Then hike through rock outcrops and a stringybark forest to the Balconies Lookout for panoramic views including the Jaws of Death. Now it’s time to cool off after an easy walk to the base of Australia’s most inspiring waterfall - MacKenzie Falls. Water cascades over huge cliffs into a deep pool, sending fine sprays of rainbow mist high into the air above a stunning gorge. On your way back to Melbourne, you'll stop for an evening meal (own expense).